This old-fashioned chocolate fudge is firm, yet melts in your mouth. It gets its decadent chocolate flavor from Divine Chocolate’s 100% unsweetened baking bar. Are you enjoying all of these #Choctoberfest chocolate recipes?! Have you entered to win one of the fantastic prize packages we’re giving away? Head on over to Monday’s post to read about the prizes and enter the giveaway. Today’s post is pure chocolate. OK, chocolate and a lot of sugar. It’s good old-fashioned chocolate fudge! 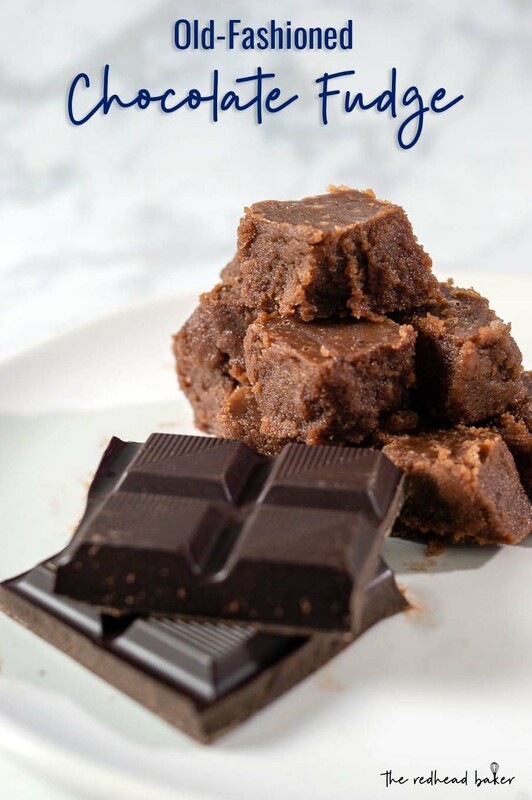 This isn’t the soft kind of fudge; it’s a little firmer, but melts in your mouth. Some consider fudge a Christmas-time treat, and it is a candy that some families make at the holidays, usually to give as gifts. I associate it more with summertime, because of summers at the New Jersey shore, where many stores sold salt water taffy and fudge. But really, is there ever a WRONG time to have fudge?? 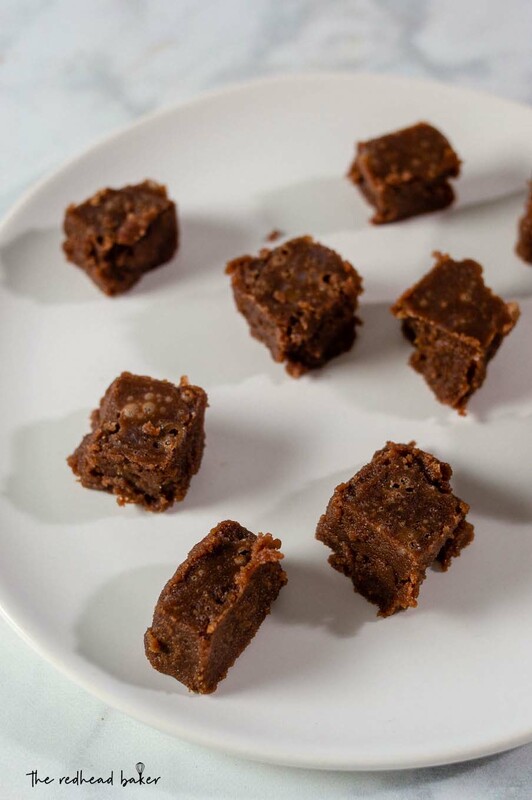 This is a simple fudge recipe that really lets the flavor of the chocolate shine. 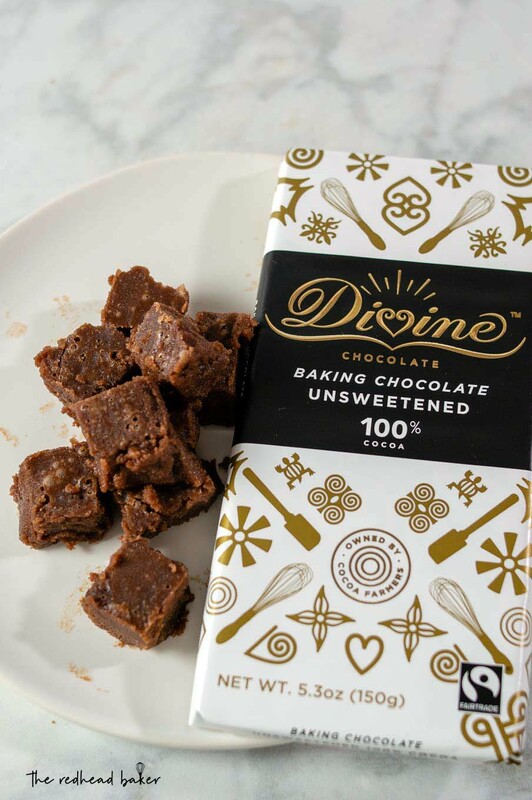 The flavor comes from Divine Chocolate‘s 100% unsweetened baking bar. Divine Chocolate is the only Fairtrade chocolate company in the world that is owed by cocoa farmers. The company is a B-corp, co-owned by the 85,000 farmer members of Kuapa Kokoo, the cooperative in Ghana that supplies the cocoa for each bar of Divine. What does all of that mean? As owners, they get a share in the profits, a say in the company, and a voice in the global marketplace. By using 100% unsweetened chocolate in this recipe, you get to control how sweet the resulting fudge is, by adjusting the amount of sugar in the recipe. Do not omit the corn syrup. 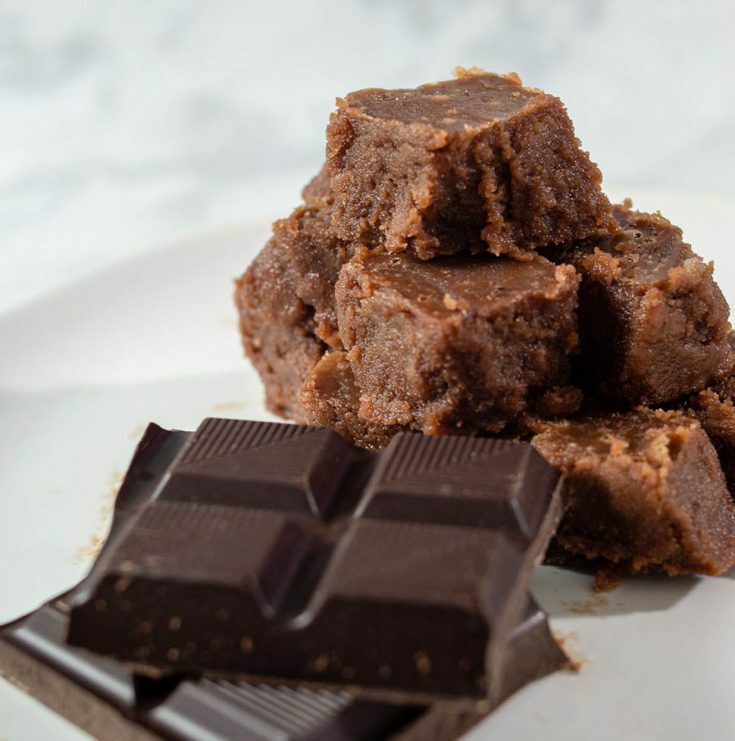 This ingredient helps prevent crystallization in your finished fudge. This is fudge candy, and as with other candies (caramels, marshmallows, lollipops, etc. ), we’re cooking the sugar to a particular “stage” that will affect the final texture of your candy. The stages refer to the concentration of water in the sugar syrup. So, having a candy thermometer is essential to making this recipe. This old-fashioned chocolate fudge is firm, yet melts in your mouth. It gets its decadent chocolate flavor from Divine Chocolate's 100% unsweetened baking bar. Grease an 8 by 8-inch pan with butter. In a heavy-bottomed saucepan, combine the sugar, chocolate, 1 1/2 tablespoons of the butter, half-and-half, and corn syrup. 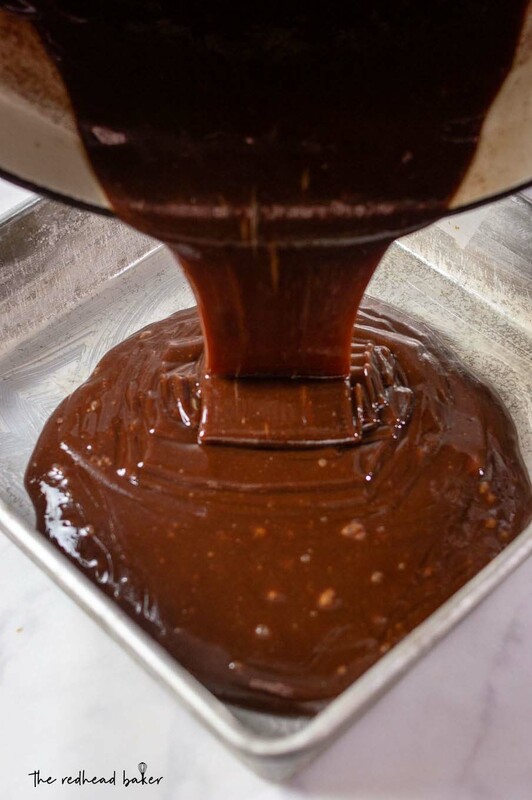 Over medium heat, stir with a wooden spoon until sugar is dissolved and chocolate is melted. Increase heat and bring to a boil. Reduce heat to medium-low, cover, and boil for 3 minutes. Remove the cover and attach a candy thermometer to the pot. Cook until the thermometer reads 238 degrees F. Remove from the heat and add the remaining butter. Do not stir. Let the mixture cool for 10 minutes or until it drops to 130 degrees F. Add vanilla and mix until well-blended and the shiny texture becomes matte. Pour into the prepared pan. If you have a lot of air bubbles, you can give the pan a firm rap or two on the counter to pop the bubbles. Pinned for holidays ! So inviting …. This is the best fudge I’ve ever made!! 10/10!! The end result has the perfect texture.